No, you didn’t misread the title. Last night, I watched “The Man from Snowy River,” and I did it voluntarily. Not only voluntarily, but eagerly. The film brought back a long lost yet treasured childhood memory. Simply the title of this movie makes me think of two people: Ginger and Brandon. I must admit that the plot of the film was almost completely foreign to me. I guess growing up I never paid attention to the story, for it is one of love, growth, and courage (as so many films today are). The movie lacks those elements that catch the youthful eye like Ninja Turtles or Gummy Bears. This story, instead, is about Jim Craig, an older boy who witnesses the accidental death of his father. The accident requires Jim to man-up, now the last living member of his family (I didn’t not catch the details of his mother’s death.) He begins to work at Harrison’s cattle ranch doing such menial tasks as shoveling manure and throwing hay. Not surprisingly, Jim falls in love with Jessica. The funny thing about this movie is the mob of horses that cause the people to fear. They refer to the mob as the “Brumbies,” and talk as if the horses were the mafia. Anyway, the story is easy to follow and culminates with the phrase, “He’s a man. The man from Snowy River.” Classic. The best scene in the movie comes when a large number of men are chasing the Brumbies to reclaim the uber-valuable horse that was let loose by a couple brutes who then blamed the escape on Jim. As the chase ensues, the Brumbies go charging down a super steep side of the mountain. All the men stop, not willing to follow in such a dangerous situation. 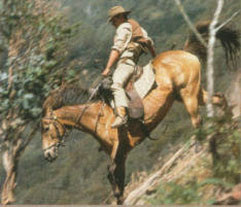 Suddenly, from behind, Jim and his mountain horse charge through and leap from the hillside. They then follow right behind the horses. Music stops, leaving only the sound of heavy breathing and falling rocks. The scene is truly stunning and very inspiring: jump off cliffs that scare most. So why do I think of Ginger and Brandon? Well, Ginger, my mother, introduced me to the film long ago. As if the movie itself isn’t good enough, the music is brilliant. We had the soundtrack on cassette tape and I remember listening to it frequently. The memory of music is inseparably connected with Brandon, my older brother. We would play and act out scenes to the music. Pretending to be horses, we’d prance around quickly to the up-tempo part and go in slow motion during the intense parts. It was hilarious. I very much remember this! Those were good times. We would stay in our room (which was demolited during the addition) and be there for hours. I can hum that entire song and know right were the fast and "slow motion" parts are. Good times! I love this movie. Your post brought back many memories for me as well. I can remember vividly sitting in a cushy seat at the Kaysville Theatre watching the beginning credits. My eyes were wide open as I saw my name come across the big screen, I turned to look at my mom with a big smile. The rest of the movie I was enamored by the beautiful Jessica only because she too had my name! Oh boy! Who can forget this show? Mom bought the piano music and it was like the first real song I learned...I think you played it too Brady! Oh and don't try and pretend like the only song you and Brandon danced to was this with majestic horses...you both rocked out SEVERAL times a week to Barbie and the Rockers too!